TransportiCA: Celebrate the California Green Academy's Second Anniversary with a Tax-Deductible Investment! Celebrate the California Green Academy's Second Anniversary with a Tax-Deductible Investment! 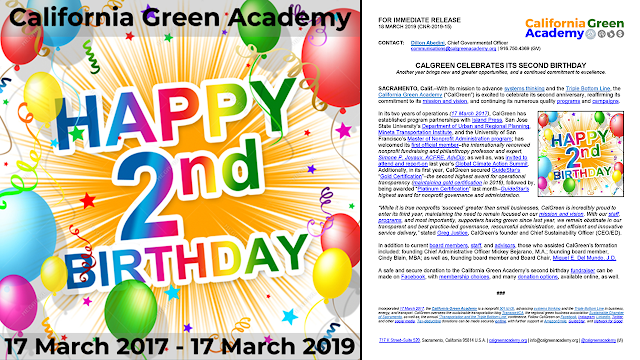 In celebration of the California Green Academy's second anniversary (17 March, parent organization of TransportiCA), we are asking you to join us in our movement for sustainable transportation education and promotion - no matter your age, with an investment in our organization. Your donation is 1-0-0-% tax deductible, 100% of funds donated go DIRECTLY to CalGreen, and will make a huge difference in the fight for clean air, transportation, and energy - but most importantly, a sustainable future.